Understanding the evolution of parasites is important to both basic and applied evolutionary biology. Knowledge of the genetic structure of parasite populations is critical for our ability to predict how an infection can spread through a host population and for the design of effective control methods. However, very little is known about the genetic structure of most human parasites, including the human louse (Pediculus humanus). This species is composed of two ecotypes: the head louse (Pediculus humanus capitis De Geer), and the clothing (body) louse (Pediculus humanus humanus Linnaeus). Hundreds of millions of head louse infestations affect children every year, and this number is on the rise, in part because of increased resistance to insecticides. Clothing lice affect mostly homeless and refugee-camp populations and although they are less prevalent than head lice, the medical consequences are more severe because they vector deadly bacterial pathogens. In this study we present the first assessment of the genetic structure of human louse populations by analyzing the nuclear genetic variation at 15 newly developed microsatellite loci in 93 human lice from 11 sites in four world regions. Both ecotypes showed heterozygote deficits relative to Hardy–Weinberg equilibrium and high inbreeding values, an expected pattern given their parasitic life history. Bayesian clustering analyses assigned lice to four distinct genetic clusters that were geographically structured. The low levels of gene flow among louse populations suggested that the evolution of insecticide resistance in lice would most likely be affected by local selection pressures, underscoring the importance of tailoring control strategies to population-specific genetic makeup and evolutionary history. Our panel of microsatellite markers provides powerful data to investigate not only ecological and evolutionary processes in lice, but also those in their human hosts because of the long-term coevolutionary association between lice and humans. Map depicting the geographic distribution of the nuclear genetic diversity among the human louse populations included in this study. Colored circles on map indicate collecting sites, with the color of each circle corresponding to the majority nuclear genetic cluster to which sampled individuals were assigned. Large colored circles are sites with 16 or more lice, small colored circles represent sites with one to three lice. Thick grey arrows indicate proposed migrations of anatomically modern humans out of Africa into Europe, Asia and the Americas, as well as the more recent European colonization of the New World. 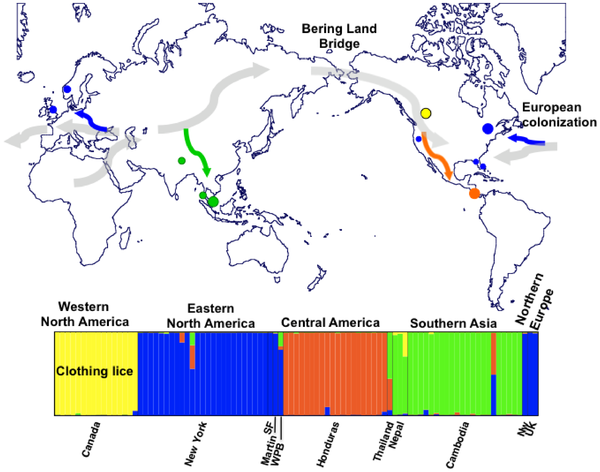 Colored arrows represent hypothetical human louse co-migrations. The bottom panel is the plot from STRUCTURE corresponding to the assignment of 93 lice from 11 geographical sites (from Figure 4A).